Published by Mountainblog on 11/16/2012 . La nuova collezione Bailo Fast Track si caratterizza nella sua declinazione invernale con capi dedicati a chi ama lo sci di fondo, lo snowshoeing, lo scialpinismo veloce o predilige attività come il Nordic Walking, la corsa su percorsi collinari o di montagna, o semplicemente vuole dei capi termici, leggeri, molto traspiranti e pratici sia per lo escursionismo invernale che per tutti gli sport invernali intensi. I capi Fast Track si connotano oltre che per l’ergonomia e la leggerezza, soprattutto per i materiali stretch, altamente traspiranti e antivento, e trattamenti tessili che permettano al capo stesso di asciugare rapidamente, con una facile manutenzione. Soft shell Windstopper® man pant wih different multi functional fabrics inserts for improved comfort. Ideal usage for fast ski mountaneeiring, cross country, winter running, snowshoeing race. 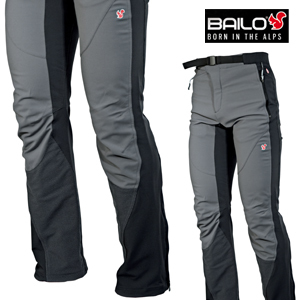 The new collection Bailo Fast Track distinguishes itself in its winter espression with clothes dedicated to people loving the cross country skiing, the snowshoeing and the fast ski-mountaineering, or better having particular preference for activities as Nordic Walking or hiking on hill and mountain routes, or simply wishing to wear ultra-light, high breathable and practicle clothes for short winter tour, for hut way approaching either. A LIFE filled with emotion, fantastic experiences and authentic adventures, many of which sensational. That is the result of a confidential relationship with nature, a deep knowledge of the mountains and the world’s most beautiful peaks. Ascents and descents that keep you speeding from the Alps to the Asian and South American mountain ranges, bold expeditions to the Poles or to the skies patrolled by the teams of Alpine Guides. A life that sets the pace for today’s dynamism; that continuous quest for new destinations. Presenting BAILO for 21st century, as always by your side and ready to offer all its experience. One that is unique and inestimable concerning research on the product as well as its clientele’s involvement. A solid path that is capable of attaining any goal. A groove, a lifestyle, a way of being spontaneous, genuine, original. A kind of promise that renews itself every season and that is energizing the winter that is just beginning.